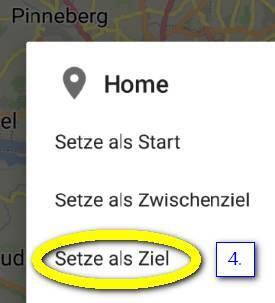 Wenn ich auf ein Lesezeichen tippe, zeigt mir die Karte die Position des Lesezeichens an. Um diesen Punkt auszuwählen, muss ich nun drauf drücken und erst jetzt öffnet sich das Kontextmenü. Ich hätte dieses Menü gerne schon bei der Auswahl des Lesezeichens, also ohne erst den Punkt gedrückt zu halten. When I type on a bookmark, the map shows me the location of the bookmark. To select this point, I have to press it and then opens the context menu. I would like if this menu appears already in the selection of the bookmark, without first holding the point in the map. I like this idea too. That would make it easier. Thanks for the proposal, could you try to explain this with a bit more detail, I couldn’t follow your description. So if you are on the map. You tap on a bookmark. The app opens a bubble that contains the name of the bookmark. You long press on a bookmark, the context menu opens. What you are proposing is that the context menu should be opened on tap instead of long press? I have to say I don’t agree with that so much, I think the “go to” use case is much more relevant and used more often. If you want “additional actions” you’re ready to go deeper so to speak, and one additional click ist justified? Then all elements should change to have menus via same expected gesture. And there could be the risk to open unwanted menus simply scrolling the map. It could seem unusual like having in desktop apps the right mouse click menu applied to left click instead. Tap on mobile is mostly used for common “fast” actions. Long press is expected for context sensitive menus, etc. I do not know if I explained it well. Therefore again with pictures. 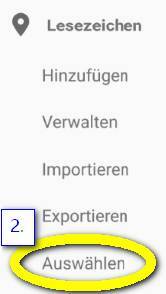 Tap on "Lesezeichen" --> "Auswählen"
Tap on one of the items, i.e. 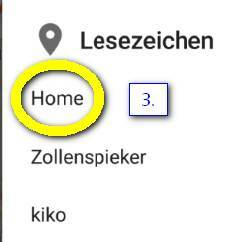 "Setze als Ziel"
Thanks for the extra details! So mean a context menu on bookmarks list, e.g. via long press. Seems interesting workflow and we can certainly consider it.